According to this poll, most of you will be doing your holiday gift shopping sometime in December. Get a head start and do some of that shopping today, aka Cyber Monday. DO take advantage of some of the great deals being offered online today. DON'T worry too much about price drops: Some stores offer price protection policies, so if the price of an item you've purchased drops, they'll refund you the difference. (I picked up that neat fact here.) Share any additional deals you find in the comments! ASOS.com: Free Shipping on all orders at ASOS.com from Black Friday through Cyber Monday! Amazon.com: 60% off retail outerwear for Men, Women, and Kids! Endless.com 2009 Holiday Promotions: $30 off select $100 orders! Plus free overnight shipping and free returns. FashionBug.com: It's Cyber Monday at FashionBug.com! Get 50% OFF our clearance items. Valid on 11-30-09 only. OneStopPlus.com: Get 30% off all styles and free shipping. Site wide coupon code CYBERMONDAY to get this discount. BeyondtheRack.com (code BTRACCESS): With every minimum $50 order placed on CyberMonday, the member receives a free Janie Besner scarf, which has a retail value of $40. LaneBryant.com: Get 40% SAVINGS SITE-WIDE at Catherines.com! Valid Black Friday, 11-27, through Cyber Monday, 11-30-09! 6pm.com: Cyber Monday Deal, 11/30-12/6: La Canadienne Footwear- 70% off Select Styles This Week! Cyber Monday Deal, 11/30-12/6: Cole Haan Footwear- 70% off All Styles This Week! Cyber Monday Deal, 11/30-12/6: Ed Hardy Apparel- Men's, Women's and Kids 60% All Styles This Week! RedEnvelope.com: Save 10% on any order, 15% on orders $80+, and 20% on orders $125+. Enter promo SRCHladder at checkout. SteveMadden.com: Black Friday/Cyber Monday Sale at Steve Madden:Take 25% Off Plus Free Shipping Using Code MADDEN25 + Free Shipping 11/25-12/7! Aeropostale.com: P.S from Aeropostale - Cyber Monday Deals - ONLINE ONLY discounts! Poll: When Are You Doing Your Holiday Shopping? Looking for cheap chic gifts for girlfriends? Check out the Demeter Fragrance sale going on now at Hautelook.com where you can pick up unique scents like grass, egg nog, baby powder or gin and tonic for $10 a bottle. That's half-off the usual price (they're currently $20 a bottle at Sephora). You will definitely score some cool points for gifting these, I'm thinking of picking up a bottle or two for myself. Use my invite link to join the sale if you aren't already a member. 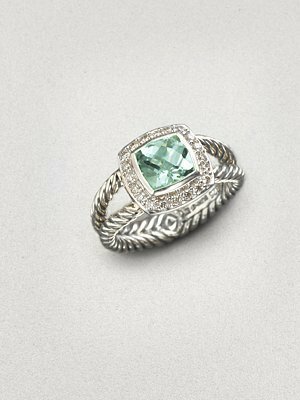 This David Yurman Petite Albion Ring/Prasiolite costs $590 at Saks Fifth Avenue. If you're not familiar with David Yurman, it's a high-end American designer jewelry company headquartered in New York City that's quite popular with the moneyed crowd. To see Lauren Conrad wearing this ring, click here. Here's another piece by David Yurman to give you a sense of what his signature designs look like. 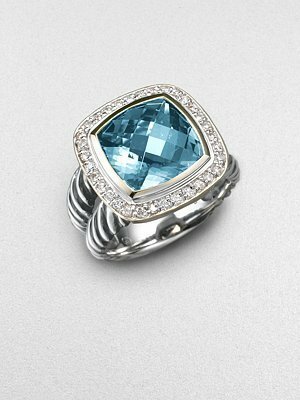 It's a Blue Topaz Ring which costs $850, also at Saks Fifth Avenue. Over the Thanksgiving holiday, I saw a dear sweet friend of mine who happened to be wearing the ring shown here. I totally thought it was a David Yurman but she just laughed and said it was from Kohls. You can purchase this ring from Kohls.com for just $6.49 on sale. Here's how the ring looks in real life. 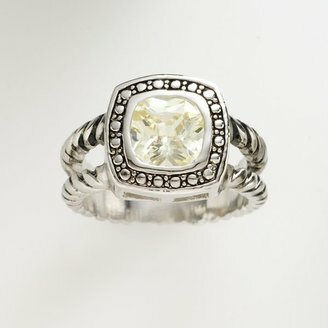 As you can see, it's not identical to the David Yurman rings above but it definitely has a similar look and feel. So pretty and such a steal!